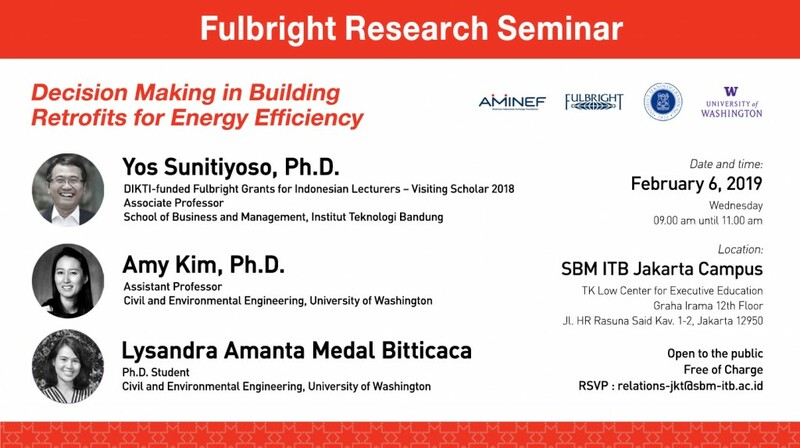 AMINEF and School of Business and Management ITB Jakarta Campus invite you to a seminar on Energy Efficiency by Dr. Yos Sunitiyoso (2018 Fulbright Grants for Indonesian Lecturers Visiting Scholar) on February 6, 2019 at 09.00 – 11.00 at SBM ITB, Jakarta with Dr. Amy Kim and Lysandra Medal of University of Washington, USA. Dr. Yos Sunitiyoso is an associate professor at the School of Business and Management, Institut Teknologi Bandung (ITB). His research interest is inthe decision sciences application (e.g. multi-criteria decision making, systems modelling & simulation, advanced statistics, scenario planning) in the area of transportation, logistics, energy and sustainability. Through his DIKTI-funded Fulbright Grants for Indonesian Lecturers Visiting Scholar Program, Dr. Yos conducted a joint-research in Decision Making in Buildings’ Energy Efficiency Retrofits at University of Washington in October – December 2018. Improving energy efficiency and conservation measures in existing buildings are becoming more important with their expected benefits for reducing operational costs and helping the environment. Retrofitting existing buildings could make a greater contribution than constructing new green buildings, as there are vast number existing buildings that require retrofits to make them energy efficient. However, the current practices to evaluate and prioritize retrofit projects among many investment opportunities do not fully capture the complexity of the decision-making process under different context for portfolio of projects. A joint research of Institut Teknologi Bandung (ITB) and University of Washington (UW) Seattle identified the key factors considered by facilities managers and the interrelationship between those factors in making decisions on building retrofits for energy efficiency. Photo documentation of event is available here.